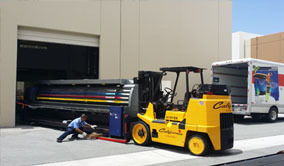 California Machinery Movers has served a variety of industries for over twenty years, providing personalized care for your project, whether it be moving large machines individually or entire industrial shop relocation. Our highly experienced riggers will assess the scope of your project and provide expert advice on accomplishing your move in a timely and safe manner. Members of the printing industry have relied on us for many years to handle their presses, cutters, folders, and other vital printing machinery. 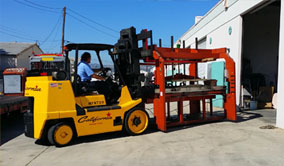 Manufacturers and CNC shops call on us regularly for moving lathes, mills, and a variety of other equipment. Moving scientific equipment is another of our specialties. We take great care in moving sensitive laboratory equipment to assure that it arrives at its destination safely, impacting efficiency as minimally as possible. 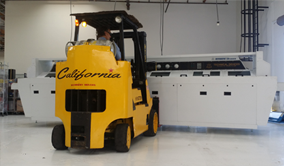 We can palletize, crate, strap, and/or shrink-wrap machines to protect them thoroughly during transport. Whatever your industrial moving needs, call us if you are looking for safe, reliable, and low-cost transportation of your machinery and large load moving needs.